Keep in mind that James was expressly addressing suffering Jewish Christians who were living outside of their homeland. While Gentiles have been grafted into the New Covenant Jesus made with Israel, it is the Jews who were first given ‘the faith of Abraham’ and who are the ones that have long waited for the time when the promised Messiah would come and set up his final righteous kingdom here on earth. Before we move onward in our study of the Epistle of James we need to keep in mind that the New Covenant, like the Old Covenant given at Mt. Sinai was given explicitly to the Jews. Gentiles have been graphed into this covenant which is an irrevocable covenant God made with Israel. Therefore, the Jewish rejection of Jesus as their Messiah does not and cannot nullify their inclusion in this covenant. In Rev. 7:1-8 where it says; “I heard the number of the sealed, 144,000, sealed from every tribe of the sons of Israel” Adventism ignores the context and clear wording of Scripture by applying this prophecy to themselves. Modern ethnic Israel does exist within their homeland. Jerusalem has been ‘rebuilt’ and it is the center and capital city of their nation. Furthermore, this passage in Revelation very specifically lists the 144,000 as being 12,000 each that come from the twelve tribes of Israel, with these tribes being listed by name. If the language of the book of Revelation is to have any meaning then the understanding of the very clear expressions used must first be given a literal understanding especially when the context does not suggest a figurative or symbolic meaning. James was originally addressing his epistle to ethnic Jews who have by faith accepted Jesus as their promised Messiah. 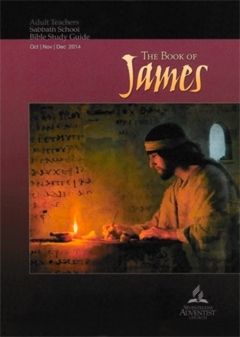 When James’ makes use of the expression “the early and the late rains” it is language that they would have understood to mean they were to have the very same patience as the farmer back in their homeland, the land of Israel, who waits patiently in faith for the nourishing rain that will water his crops as ordained by God. Today’s lesson is centered upon the words of Ellen White concerning the working of the Holy Spirit during the times of ‘early rain’ and ‘latter rain’, James 5:7. When we consider what Scripture actually teaches it becomes evident that there are important problems with Adventist theology that need to be addressed concerning the perceived working of the Holy Spirit and ‘End Time Events’ as mentioned in James 5:8. In today’s commentary we will return to the theme of ‘the early and later rain’ covered yesterday. In James 5:7 the word ‘therefore’ tells us that this passage is an instruction built upon the verses that preceded it. The righteous person is beseeched to be patient under the persecution of those who are rich and powerful for their persecutors are the ones who will end up howling as a result of the miseries that are going to come upon them. This passage in Revelation, recorded by the Jewish Apostle John, is the most likely ‘later rain’ prophesied in Joel and apparently alluded to in the Epistle of James. Once again we are examining a passage that has nothing to do with Adventism. The use of the expression ‘the early and the later rains’ has been high jacked out of its intended meaning and context by Adventist theology without biblical support for having done so. There is no justification for not accepting the literal understanding that the 144,000 ‘sealed servants of our God’ are historic ethnic Jews who have accepted Jesus as their Savior, the promised Messiah. Day Three, Monday, Dec. 8: How Near Is “Near”? “in sharing the gospel with the world had they known that the work would not be finished for almost two thousand years—and counting”? Notice the phrase “the work would not be finished” that is quoted from the lesson introduction. For a non-Adventist this probably wouldn’t mean anything other than there is still work to be done. However, in Adventist theology and preaching the unstated implication is obvious. The Adventist belief is that what has delayed the ‘second coming of Christ’ is the failure of the ‘Remnant church’, meaning Adventist Believers, to complete the work of delivering their unique gospel message to the world. “Had the purpose of God been carried out by His people in giving to the world the message of mercy, Christ would, ere this, have come to the earth, and the saints would have received their welcome into the city of God” (Testimonies for the Church, vol. 6, p. 449). “Christ is waiting with longing desire for the manifestation of Himself in His church. When the character of Christ shall be perfectly reproduced in His people, then He will come to claim them as His own” (Christ’s Object Lessons, p. 69). However Scripture says nothing about Christians needing to ‘complete the work’ of spreading the gospel message or that ‘Christ’s character needs to be perfectly reproduced in his people’ before he can return. When asked by Jesus disciples in Matthew chapter twenty four; “Tell us, when will these things be, and what will be the sign of your coming and of the end of the age?” Jesus responds by teaching many things but is absolutely silent about the need to complete the spread of the gospel or for his followers to be able to reproduce his own righteous character perfectly within their lives before he can return. Instead, he says that only the Father knows the actual time of his return. We are to stay awake and watching and to be ‘feeding the flock’ when he does return. Jesus isn’t waiting us to complete the ‘work’ in ‘the end times’. Instead, it is complete because he does return. The return of our Savior is totally within the prerogative of God the Father. It is not contingent upon what anyone here on this earth does or fails to do. For those who believe or otherwise understand Adventist theology, today’s lesson theme which is supported by this Ellen White quote, is a clear reference to her message and book called The Great Controversy. According to this Ellen White quote Christ’s return has been delayed by the activities of Satan and his evil angels. In the Old Testament we find in the book of Job that there are none who can challenge or in any way affect the intent and activity of God. When you study of the book of Job be sure to focus on and understand God’s message to Job beginning at chapter 38 concerning God’s absolute sovereignty. The promises contained in the above quote are true because the power of God is infinitely above any of his creations. This would certainly include Satan and his evil angels. It is both nonsense and heresy to say and suppose that Satanic Forces are holding up the return of our Savior. Nor does the character or activities of his righteous saints have any affect in the timing and will of our sovereign God. The Father of our Savior, based solely on his own authority, knows and determines the ‘day and time’ of the Second Coming of Christ. The theme of ‘The Great Controversy’ is a fraud. There is no cosmic battle that must be won before Christ can return. The failure of Christians ‘to complete the work’ is not the supposed cause for our Savior having not yet returned. God need not and does not justify his character to those he has created. In the perfect sovereign will and intent of the Father Jesus Christ will return. The lesson makes some very good points about the importance for Christians to patiently endure the struggles we face living in this sin filled world as this produces “the steadfastness of Job” as we rest upon the promise of our Savior that he will return again without fail. The roots of the existence of Seventh-day Adventism is founded on impatience by ignoring the very words of Jesus, in defiance of what he said, by setting the date of Oct. 22, 1844 for his return. Instead of confessing their sin of impatience, the founders of Adventism compound their sin by giving importance to this date through the introduction of the unbiblical Investigative Judgment doctrine. True saints of God will steadfastly remain patient knowing the return of our Savior will occur at a time we least expect. Stay awake! This was just as true in 1844 as it is now. Today we turn our attention to James’ admonition recorded in James 5:12. Verses 1 through 6 of this chapter outlines how and why Jewish Believers are suffering at the hands of the rich and powerful. Verses 7 through 11 compares their need for patience to that of Job’s suffering. Now, in verse 12 the text begins with the phrase; “but above all”. In all that Job was suffering, including the many false charges of his friends that he must be guilty of a secret unconfessed unrepented sin, Job never turned against God and curse either his friends or God. His yes was yes and his no was no in response to the charges his friends made against him. Our conduct as a Christian, including the words that come out of our mouth, should reflect the same trust in God Job had during his time of suffering. Except for the ultimate suffering of Jesus Christ at Calvary for the remission of our sins, most of us have ever suffered in the way Job did. Even while Job was experiencing severe suffering he kept the words of his mouth and heart truthful and simple. He never lost trust and faith in God or charge him with doing wrong. Today’s lesson includes several Ellen White statements concerning “testing” and “trials will come” in “the last days” that summarize the theme of ‘patience’. The first of the discussion questions for today however raises the question of church discipline with a supporting reference to the parable of ‘The Wheat and the Tares’ as is recorded in Matthew chapter thirteen. Concerning the reference to the parable of ‘The Wheat and the Tares’ given to us through the very words of Jesus, we need to study what is actually said in Scripture. What, if anything, does the parable of ‘The Wheat and the Tares’ teach us concerning church discipline? The parable of ‘The Sower’ is explained in verses 18 through 23. The sower is the one who preaches ‘the word of the kingdom’. This can be none other than the gospel message of salvation to a world of lost sinners (which is the field the seed was sown in), the ‘seed’ being the message of salvation that falls upon various ‘soils’ (in the field) which would be the hearts of those who hear the message of the ‘Sower’. Only on good soil does the seed grow to maturity. The evangelist preaches (the owner of the field) the gospel message (the good seed found only in Scripture) to the lost in the world (the farmer’s field). The enemy (Satan) scatters bad seed (the same lie he gave to Adam and Eve) in the field. Clearly, the field in these parables is ‘all the world’ the original disciples and all other Christians are to take and preach the biblical gospel message of salvation, 1 Cor. 15 & Matt. 28:16-20. The tares are not separated and bound for burning until the time of the harvest. Therefore none of these interconnecting parables have anything to do with present day church discipline. They are all about preaching the pure simple gospel message to a lost and dying world of sinners knowing that the message will be rejected by many if not most who hear this message. The seed that gives life where there was no life is the gospel message of Jesus Christ, 1 Cor. 15:1-19. Only God, not the farmer who scatters the seed, brings the sun and the water that nourishes the good soil so that the seed will sprout into life. We’re not even to be concerned with the weeds that spring up amongst the healthy wheat. Removing them at the time of harvest is another work of God. You, if you are a good farmer, will only scatter good seed in your field as this ‘seed’ (the gospel message of the blood of Jesus shed at Calvary for the remission of the sins of the world) is the only ‘seed’ that can bring life where there is no life. It is interesting, considering that the title for this week is; "Getting Ready for the Harvest", that the parables recorded in Matthew chapter thirteen would have been an appropriate way to end the lesson studies for this week. This would have at least been in keeping with the Adventist understanding of the “later rain” mentioned in the Epistle of James and would have been a summary of this week’s theme. What a pity to focus on Ellen White quotes instead of the contextual meaning of Scripture. The question of church discipline has nothing to do with the parable of ‘The Wheat and the Tares’, nor the lesson theme of ‘patience’ because: The tares that spring up from the seed of Satan that is bound for burning has nothing to do with discipline within the church which is the wheat that springs up from the good seed, the gospel of Jesus Christ.